COMPANY PROFILE : KHON KAEN FISHING NET CO.,LTD. the Company was founded and registered by the start of the 10 machines and 60 employees with 16,000 square meters. KKF started to export the products to Asia, Indo-China, Europe, America, Scandinavia and Africa and have developed a fishing net machine that has been used for the production of net in the factory. BWC branch and the factory for the production in Shantou, Guangdong in the People's Republic of China were founded. The Fortune Machinery Co., Ltd. was founded to produce the weaving machine. 3 branches were additionally founded. 1 branch was in Khon Kaen Province at Muangkao subdistrict where were 2 branches in Maha Sarakham Province at Waengnan Subdistrict and Chiunchom District, and founded a branch office in Myanmar and Ho Chi Minh, Vietnam. Khon Kaen Fishing Net Factory Co., Ltd. has applied an ISO 9002 and has been received a license at a later time. Currently developing a quality management system ISO9001: 2008. The Company has extended to the Latin America countries in the collaboration with the BKT Company in Brazil. The net factory was founded in Anhui, People's Republic of China. The net factory was founded in Yangon, Myanmar. The Auto Motion Work Co., Ltd. was founded to produce and sell the automatic warehouse in Khon Kaen Province. 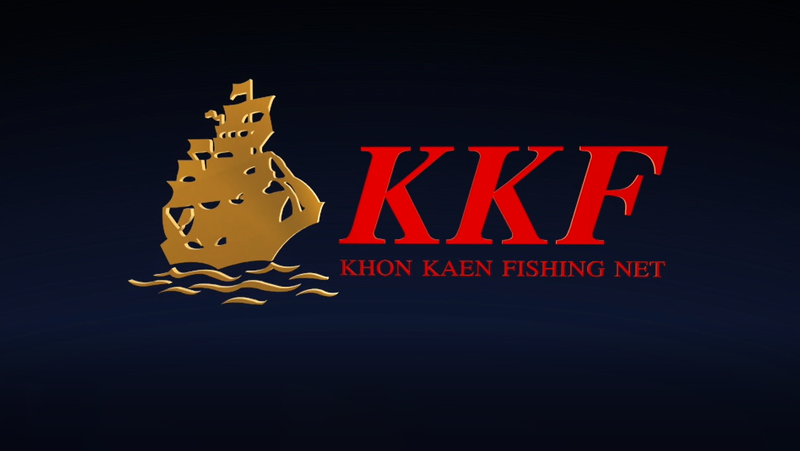 Khon Kaen Fishing Net Factory Co., Ltd. or KKF is the large and one of the most successful manufacturer and distributor of nets and fishing, agriculture and other related industries equipment in the world under the brand “sailboat” or ‘SHIP’. Khon Kaen Fishing Net Factory Co., Ltd. is ideologically managed under the ethics and the principles of the good governance. Khon Kaen Fishing Net Factory Co., Ltd. attends in a joint initiative and a corporate social responsibility (CSR) in order to have a better quality of life by manage in the education and sport promotion, the organization support, the career promotion to the disable person, doing activities with the community, the anti-drug campaign etc. Khon Kaen Fishing Net Factory Co., Ltd. is focused on the production process for the high quality products before delivery to the customer with the quality system certification ISO 9001: 2008 as well as the importance of safety, occupational health and working environment for all employees. We have highly determined to be a leader in fishing nets industry anddouble our sales volume withinnext five years starting from 2013. Have an honesty, assiduity and endurance. Respect, be modest and honor to others. Continuously learn and adopt new things. Consciously create and make and up-to-date. -	Founder of Khon Kaen Fishing Net Factory Co., Ltd. in 1977. At the present, he takes a position of Khon Kaen Fishing Net Factory Co., Ltd’s President. -	Founder of Khon Kaen Filament Industry Co., Ltd. This produces all kinds of filament. At the present, he takes a position of the Company’s President. -	Founder of K.R. Plastic Industries Co., Ltd. This produces all kinds of filament. At the present, he takes a position of Company’s President. -	Founder of Fortune Machinery Co., Ltd. This produces machines, spare parts and equipments for fishing. At the present, he takes a position of the company’s President. - Founder of Khon Kaen Fishing Net Factory Co., Ltd. in 1977. At the present, he takes a position of Khon Kaen Fishing Net Factory Co. , Ltd’s Vice President. -	Founder of Myanmar Khon Kaen Trading (MKT) at Yangon, Myanmar in 1996. -	Founder of Brazil Khon Kaen Trading (BKT) at Sao Paulo, Brazil in 2001. -	Founder of Anhui Khon Kaen Fishing net Factory(AKF) at Anhui, People's Republic of China in 2007. At the present, he takes a position of Anhui Khon Kaen Fishing net Factory ’s Chief Executive Officer. -	Graduated in bachelor’s degree of Political Science, Politics and Government Management Program, Ramkhamhaeng University. -	Founder of Khon Kaen Fishing Net Factory Co., Ltd. in 1977. At the present, he takes a position of Khon Kaen Fishing Net Factory Co., Ltd’s Chief Executive Officer. -	Founder of Khon Kaen Filament Industry Co., Ltd. This produces all kinds of filament. At the present, he takes a position of the Company’s Chief Executive Officer. -	Founder of K.R. Plastic Industries Co., Ltd. This produces all kinds of filament. At the present, he takes a position of Company’s Advisor. -	Founder of Fortune Machinery Co., Ltd. This produces machines, spare parts and equipments for fishing. At the present, he takes a position of the company’s Chief Executive Officer. -	Member of Khon Kaen Federation Industries. -	Member of Khon Kaen Chamber of Commerce. -	Member of Khon Kaen Red Cross. -	President of Associate Judge, Khon Kaen Juvenile and Family Court. -	President of Northeastern Autistic Parents Club. -	President of Khon Kaen Autistic Parents Club. -	School Committee Chairman of Special Education Center Area 9, Khon Kaen Province. -	Vice President of Khon Kaen Textile Industries, during 2007-2008. - Advisor of Khon Kaen Federation Industries, during 2004-2006. -	Bachelor of Engineering Program in Industrial Engineering from King Mongkut’s University of Technology Thonburi. -	Master of Business Administration from the United States of America. -	Started working in Khon Kaen Fishing Net Factory Co., Ltd. since 1988, in the position of Assistant Factory Manager. -	Subsequently appointed to a position of Deputy Managing Director of Khon Kaen Fishing Net Factory Co., Ltd. and Managing Director of Khon Kaen Fishing Net Factory Co., Ltd., respectively. -	Present hold a position of Managing Director of Khon Kaen Fishing Net Factory Co., Ltd. Managing Director of K. R. Plastic Industries Co., Ltd. Managing Director of Infinite Green Co., Ltd.
-	Bachelor of Industrial Engineering, Faculty of Engineering from Khon Kaen University. -	Started working in Khon Kaen Fishing Net Factory Co., Ltd. since 1984, in the position of Engineer on the Production Department which supervised and controlled of the weaving production. -	In 1992, Mr. Wutthichai has been promoted to Fishing Net Production Manager. -	In 1995, Mr. Wutthichai has been assigned to supervise in all of production line and has been promoted to the director of the production line, receiving the policy of the Company to expand its capacity and push forward the production into a total of 6 branches where 4 branches in Khon Kaen Province and 2 branches in Maha Sarakham in order to support the customer base expansion of the marketing line. Director of Machinery Production Line / Director and General Manager of Auto Motion Work Co., Ltd.
-	Bachelor of business administration from Ramkhamhaeng University. -	Master of Business Administration from NIDA. -	Started working in Khon Kaen Fishing Net Factory Co., Ltd. since 1986, in the position of Assistant Sales Manager and had built the sales and warehouse system as computer system. After that Mr. Vinit had been the Computer Center Manager and the Executive Director, respectively. -	After Graduate from NIDA, Mr. Vinit returned to take the position of Assistant Director of Marketing. At that time, the Company has founded the engineering research institute and was concurrently Director of Machinery Production Line. -	In 2013, Mr. Vinit took the position of Director and General Manager of Auto Motion Works Co., Ltd., which is the first manufacturer of Automatic Warehouse in Khon kaen. Khon Kaen Fishing Net Factory Co., Ltd. (KKF) established in 1978 producing the net to use in the fishing and agricultural industry. KKF has ongoing learned, adapted and developed the organization. Throughout the period of the business operation, KKF has adhered in the fair to all stakeholders of the organization, including the employees, distributors, customers, suppliers and surrounding communities with regard to the impact on the economy, the society and the environment. The Company has the will to develop the better product quality and performance to satisfy the consumers and intends to develop the management and manufacturing process, using technology that is eco-friendly to reduce the energy consumption and the waste in production process. KKF is intended to maintain to be the one in the net industry sustainability and has a growth for 50% within 2015 under the efficient management, excellent technology and new innovation creation.